Photo Courtesy of Mashpi Lodge. The Mashpi Lodge is located within the Chocó biogeographical region which runs through Panama, Colombia, Ecuador and Peru. This biodiversity hot spot is a “Model Forest” in Ecuador. Only 28 of these hot spots exist world-wide. The lodge which features five-star comfort is the base for not only the hotel but also the conversation and research efforts in the reserve. Try the Dragonfly aerial cable car or head out on a night walk to see frogs, insects and trantualas. Take a hike to one of the waterfalls located in the reserve. Mashphi is the perfect place to escape the headaches of everyday life and unplug! Photo Courtesy of 98 Acres Resort and Spa. Located in the serene hill country of Sri Lanka, 98 Acres Resort and Spa is the perfect place to escape it all. Built on a 98-acre tea farm, the resort offers hiking, biking, bird watching and cooking classes. 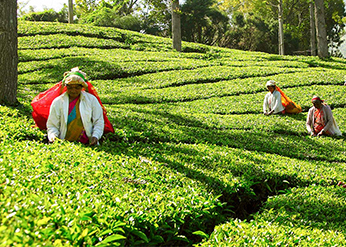 You can also take time to explore the tea farm and understand the tea-making process from start to finish. With private chalets built from recycled and re-purposed materials, the resort is the perfect combination of privacy and adventure! Photo Courtesy of Song Saa Private Island. Song Saa is the ultimate example of a resort that has partnered with the local community to build a sustainable resort and conservation effort with far-reaching impact. The private island offers only 24 villas each with a private pool and spectacular views. Opportunities for snorkeling, scuba diving, cooking, kayaking, trekking and exploring abound in this pristine nature reserve. Guests can also head to the nearby conservation center or experience a Buddhist blessing ceremony. Come to Song Saa to give back to the community. Turn off your phone, ipad and computer and truly escape the noise! The Icehotel in Jukkasjarvi is located 200km north of the Artic Circle. Reborn every year since 1989, the hotel now maintains a permanent structure called Icehotel365 which features luxury suites and an ice bar and can now be visited all year-round. Located on the Torne River in a pristine part of Sweden, the Icehotel has committed to becoming CO2 neutral and has installed solar panels which capture the summer’s 24-hour sunlight. Head north to meet reindeer, see the Northern Lights, ride snowmobiles and go dog-sledding. Unplug and embrace the cold! If you're learning more about inspired ways to escape the noise and unplug, contact me here.